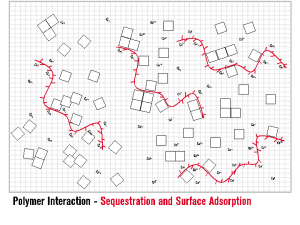 INITIA® Polymer Additives utilize six key functional elements to control mineral scale: Sequestration, Chelation, Stabilization, Dispersion, Crystal Habit Modification, and Threshold Inhibition. 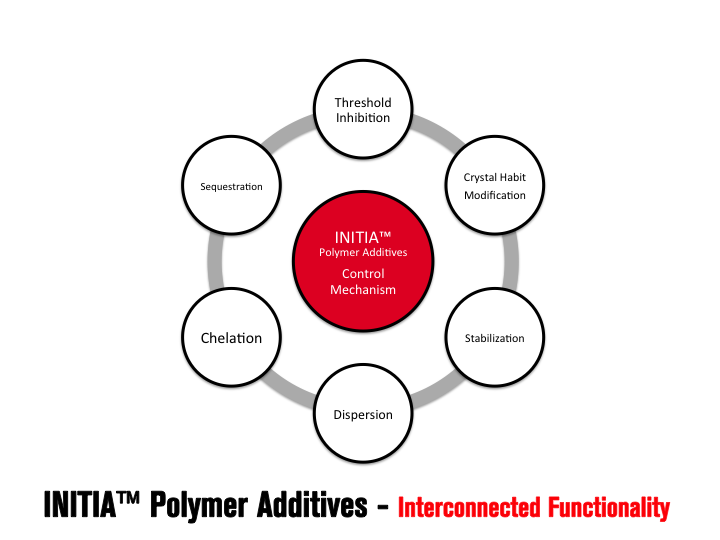 Compared to a typical view of the functionality of polymers, INITIA® Polymer Additives offer an Interconnected Control Mechanism, which is optimized for enhanced deposit control. 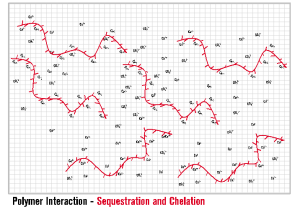 INITIA® FUNCTIONALITY – SEQUESTRATION AND CHELATION Sequestration is likely the first interaction employed in the battle of controlling mineral scales such as calcium carbonate. INITIA® Polymer Additives are highly effective in this first line of defense. INITIA® Polymer Additives sequester metal ions such as calcium, magnesium, barium, iron and zinc such that they are unavailable for combination with counter ions such as carbonate, sulfate, phosphate and hydroxide. By definition, INITIA® Polymer Additives also act as Chelators since two or more of the polymer acid groups are required to fully sequester each multi-valent ion. 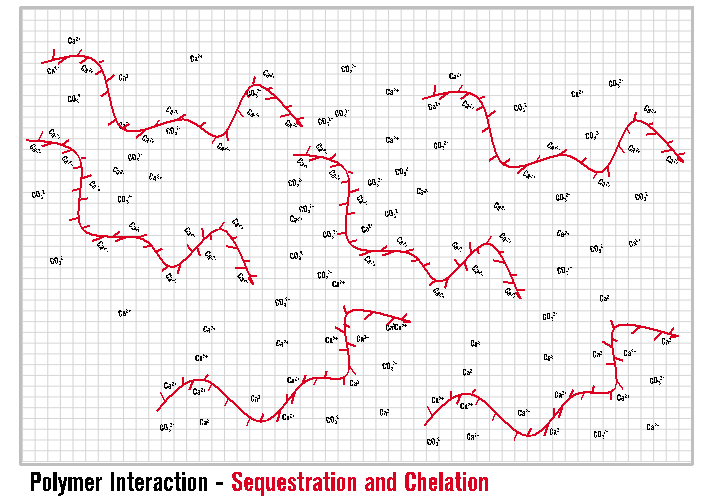 The functionality of sequestration and chelation by INITIA® Polymer Additives is typically temporary in process water treatment applications such a cooling towers and boilers. The duration (how long?) and extent (how much?) the polymer can maintain solubility of metal ion in an environment where a scale forming counter ion is present, is dependent upon many factors. The primary of these are the concentration of the scale forming ions [Metal Ion+][Counter Ion–]), pH, temperature, polymer concentration, polymer efficacy (design), presence and concentration of suspended solids, presence and concentration of other soluble ions, the rate in which the water (and its impurities) are concentrated and the frequency of polymer addition. 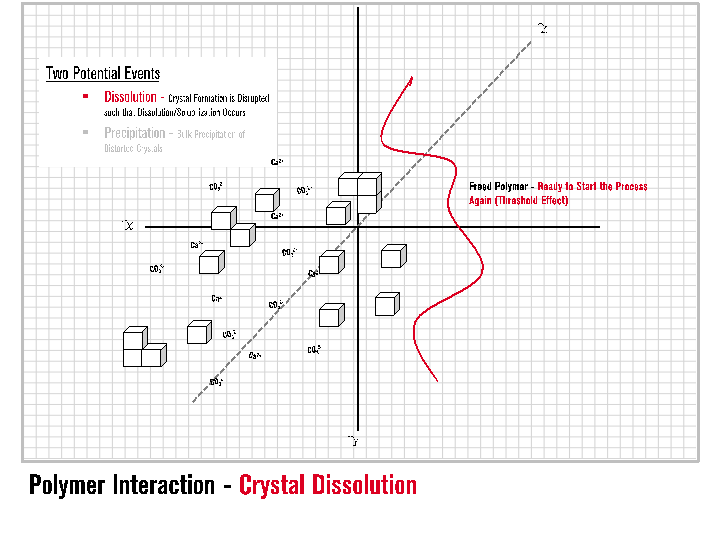 As mineral scale begins to precipitate it is necessary for the polymer to interact with both the soluble metal ions that remain in solution (sequestration, chelation) and also interact with forming crystal lattices, which are sometimes referred to as crystalloids. 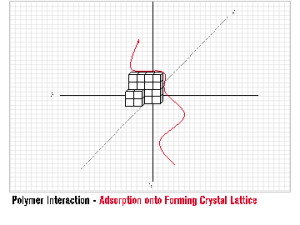 These crystalloids can be thought of as “pre-crystals” as they have begun to form crystal lattices that are necessary for formation of macro, insoluble scale. 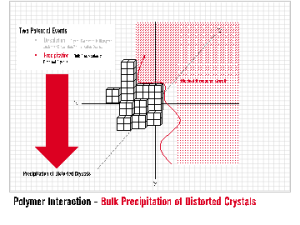 These crystalloids are considered soluble or, at least, at the precipice of precipitation. 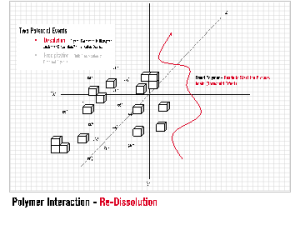 At this point in the scale control process, INITIA® Polymer Additives function to exhibit Stabilization properties. INITIA® Polymer Additives are effective in stabilization of crystalloids beyond that of colloidal particles thus preventing bulk precipitation and deposition. Threshold Inhibition requires a sub-stoichiometric relationship between the level of additive and the scale forming species. INITIA® Polymer Additives are highly effective threshold inhibitiors for a wide range of typical mineral scales. INITIA® Polymer Additives function via a process of partial and/or temporary sequestration, adsorption upon forming crystalloids, and subsequent re-dissolution of the interrupted crystal lattice. INITIA® Polymer Additives fight this battle on two fronts: the water-soluble battle with multi-valent metal ions and the water insoluble battle against forming mineral scale crystalloids. As defined, threshold inhibition is a temporary effect. Thus, INITIA® Polymer Addtives are winning and losing each of these battles simultaneously until bulk precipitation occurs. 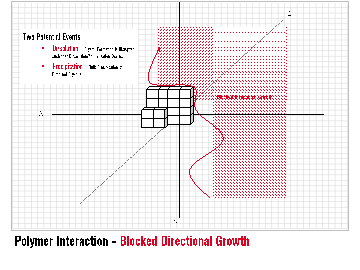 Threshold inhibition is an extraordinary event that is somewhat specific to certain polymers types and phosphonates. INITIA® Polymer Additives are unique and effective tools that provide threshold inhibition properties. INITIA® Polymer Additives are effective in maintaining a suspension (dispersion) of particulates in solution by electrostatic repulsion. 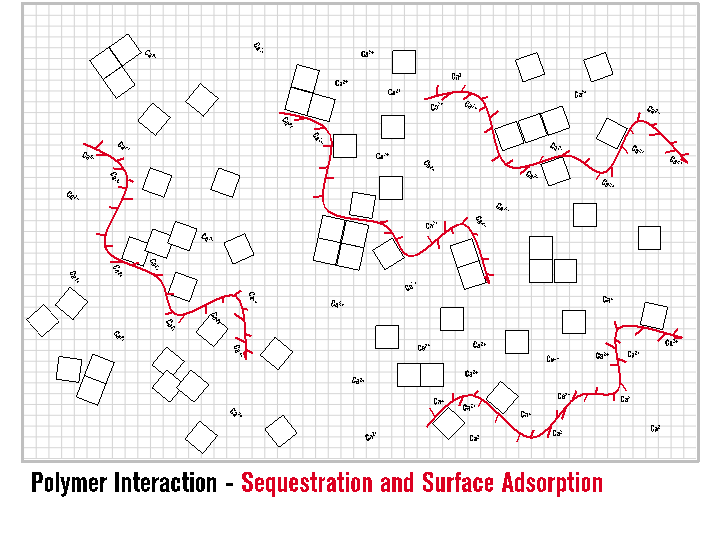 INITIA® Polymer Additives interact with precipitated scale to limit agglomeration, bulk precipitation and resultant separation from solution. One of the most unique benefits of INITIA® Polymer Additives is their efficacy as crystal habit modifiers. 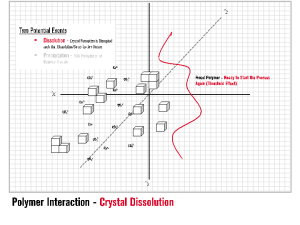 The concept of Crystal Habit Modification is simple and qualitative. 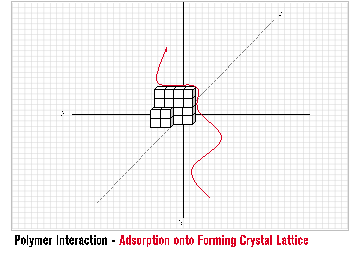 INITIA® Polymer Addtives adsorb onto the surface of a forming crystal lattice, impede the directional growth of the lattice, and subsequently promote the formation of precipitated crystals that are abnormal in shape, size, and overall appearance.